some content from this book. SPOKANE, WA—Social media did not cause the Arab Spring two years ago, but they contributed to the organization, speed and significance of the tumultuous uprisings that toppled three regimes in North Africa and the Middle East and played significant roles in other global events, including the re-election of Barack Obama. 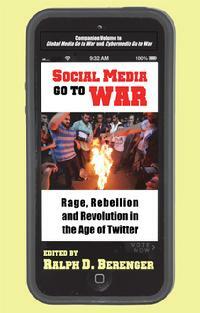 These are some of the conclusions drawn by international scholars in a new book, Social Media Go to War: Rage, Rebellion and Revolution in the Age of Twitter, published by Marquette Books in Spokane, Washington. Thirty-nine scholars contributed 29 chapters in the wide-sweeping analysis of social media use in war, insurrections, revolutions and quests for social justice in Cuba, Georgia, Egypt, India, Iran, Jordan, Thailand, Tunisia and the United States, where President Obama’s use of social media contributed to his November victory, and mobilized protesters in the Wisconsin budget battle. The shifting the U.S. Department of Defense policies on social media use by military personnel are also analyzed. The 524-page book also looks at the philosophy, theories and policies behind social media before launching into case studies around the world. Separate parts of the book examine the “Persian Spring” in Iran in 2009, and the Arab Spring in Tunisia, Egypt and Jordan in 2011. The book completes a trilogy of books published by Marquette Books that examine media behavior in times of turmoil and crisis. All three were edited by Dr. Ralph D. Berenger, a mass communication professor at the American University of Sharjah in the United Arab Emirates. Other books in the series were the critically acclaimed Global Media Go to War: Role of News and Entertainment in the 2003 Iraq War (2004) and Cybermedia Go to War: Role of Converging Media During and After the 2003 Iraq War (2006). The individual empowerment movement began with Weblogs around the time of the 2003 Iraq war, Berenger said, and reached its current peak with social media sites such as Twitter, where anyone can make their opinions known and “scoop” the mainstream media, which often acts as a “megaphone for unmediated information” that might shape the information disseminated through mass media. Social Media Go to War should appeal not only to media scholars but to general public concerned with how media behave—and influence them—during times of crisis and turmoil.